This product was added to our database on Wednesday 10 November 2010. 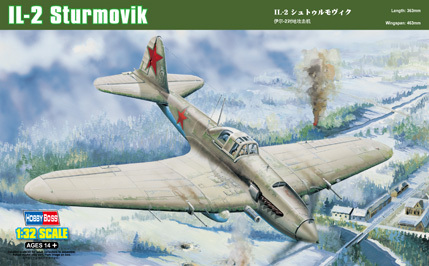 The Ilyushin IL-2 Sturmovik was a Soviet Union attak aircraft in the WWII. Designed as a armored low-level close-support aircraft capable of defeating enemy armor and other ground targets. First flew on 12 October 1940 as prototype TsKB-57, The aircraft entered production in March 1941,and come into service in May. a total of 36,163 were built. The Sturmovik played a crucial role on the Eastern Front, famous nicknames as the "Black Death" . IL-2 Single-seat version,the early production, delivered to combat units in May-June 1941, Powered by AM-38 engine, equipped 20 mm ShVAK or 23 mm VYa cannon in main wing.